Red Rock Canyon is located just 30 minutes west of Las Vegas. It's perfect for trail running, but for some reason I saw very few people running there one recent weekend. The Grand Circle trail is about 11 miles long, and it starts right outside the Visitor's Center. It's pretty easy – it loops around the valley and has barely any elevation gain. I made some detours along the way to add a bit of distance, aiming for a 13-mile run. However, when I got to the 10-mile point, it rained out on me. Desert storms remind me of tropical thunderstorms – the sky turns dark in an instant, and it starts unloading on you. Fortunately, I hitched a ride back to the Visitor's Center where my car was parked. Las Vegas may be known for its debauchery, but it's actually right-smack in the center of some of the most stunning desert terrain in the country. Drive 45 minutes east of the Strip and cross over into Arizona, where a rewarding 6-mile roundtrip hike to a hot spring awaits. The terrain starts off flat and open, but you'll soon descend into a canyon. The hot springs actually consists of three pools, dammed up by sandbags. The pool closest to the source is the hottest. It's pretty amazing to be soaking in a natural hot tub deep inside a desert canyon. Hiking is not about the destination; it's about the journey. Early on, I learned that if I kept thinking about the end-point of a hike (the part where I reach the top of a mountain and get to take a long lunch break enjoying the gorgeous views and eating that tempting sandwich in my backpack), I wouldn't fully appreciate what was around me. I would miss out on the scent of the forest, the sounds of wildlife and the understated beauty of the nature around me. And therefore, I quickly came to the conclusion that while it's important to hike towards a destination, it's also perfectly okay to not ever reach it. This is important because I now have the license to abandon hikes and turn around when it's more difficult to go on, or when I simply don't feel like it. That's what happened on the Siphon Draw Trail, an extremely challenging hiking trail starting from Lost Dutchman State Park and continuing onto the Superstition Wilderness area. The trail started off pretty easy, but it got steep very quickly. There was a good amount of scrambling over rocks, and the trail was not well-maintained above a certain point (rocks along the trail supposedly had these blue or white paint dots on them, but it was almost impossible to spot these faded markings) And because it had rained the previous day, it was a little slippery, too. Plus, the day I went, it so happened that 25mph winds were blowing. I probably went up 80% of the way before I decided to give up. (A good lesson to keep in mind that if hiking up is tough, going down is going to be a lot tougher!) They don't call this the most challenging hike in the Valley (i.e. greater Phoenix area) for nothing. On the plus side, this trail did not have any lack of views. The rocky landscape, studded with Saguaro cacti and other desert shrubs, took my breath away. Thanks to the previous day's rain, I also saw a waterfall spill over the cliffs and an extremely fast flowing stream carving through the rocks – making for an extremely special hiking experience in the usually parched desert. I would recommend this trail in a heartbeat. Just don't get too upset if you can't go all the way to the top! Roundtrip distance: 5.5-6 miles (according to the guy at the park office), but you don't have to go all the way to the top. Special caution: Wear hiking boots, and not running shoes. You're going to want some traction on this steep hike. Trail starts off pretty gentle, but your ultimate destination is up those enormous rocky outcrops. This reminded me of Jurassic Park. In fact, dinosaurs once roamed Arizona and much of what is now the United States. I'm surprised by how the outdoors is so easily accessible from Phoenix, one of America's largest cities. My favorite part about my trip to Phoenix was doing some trail running at South Mountain Park. South Mountain is one of the world's largest city parks, and it's 16,000+ acres of stunning desert hills and valleys. I parked at the Pima Canyon trailhead, and ran parts of the National Trail. Here are some pictures to whet your appetite and also remind myself that I want to go back soon. The trail is pretty rocky, which adds to the fun of it. There's uphill and downhill portions, but it really isn't THAT bad. At the Hidden Valley portion of the trail, there's some really fun mini-adventures like squeezing through huge boulders and jumping down from large rocks. Running in these surroundings is just plain bliss. I have to confess, though, I don't know what it's like during the summer! During my visit to Sedona over Christmas, it snowed. The landscape of red rocks became even more stunning with a dusting of snow on them. I enjoyed a short run along the Airport Mesa Trail, taking in the views and trying my best not to slip and fall. Hiked up Doe Mountain before a snowstorm rolled in to Sedona on Christmas Eve. Doe Mountain was recommended by the inn we were staying at as an easily-accessible hike with good views. It was a very short hike, with a bit of elevation gain. I can't remember exactly, but I think we took no longer than 45 minutes each way. It's not a well-kept secret that Washington, D.C. is one of the best places to view cherry blossoms outside of Japan. I took a trip there last weekend, and was blown away by the amazing display. My friends and I walked around the Tidal Basin, which featured cherry blossom-fringed views of monuments like the Washington Monument or MLK Memorial. However, it was extremely crowded. These were the pinkest cherry blossoms that we saw. Almost all the others were a fluffy white, as you'll see in the pictures below. Kenwood, Maryland is a suburb 20 minutes away from DC by car. It was far quieter and in my opinion, a much better place to enjoy the cherry blossoms away from the crowds in the Tidal Basin. Nearly half a year ago, I left my job at Microsoft, packed my bags and embarked on a 2-week long roadtrip for Pittsburgh, PA. I've always wanted to pen this post but never found the time or motivation to do it. But I'm glad it's finally taken shape. Because it was a long trip, I'll be splitting this into several posts. I left Seattle on September 23, 2015 -- the day before my birthday. The night before, I stayed with my best friend in Seattle in his apartment near the Microsoft campus. Xi Jinping was visiting, and there were a bunch of protestors demonstrating near the 520 freeway ramp. Fortified with dumplings from my favorite Taiwanese breakfast place in Factoria, I set off. I felt slightly wistful to be leaving Seattle but the air was also full with possibility. And just for the day, the Pacific Northwest sky decided to don her most gorgeous blue. Oh, how I miss Seattle. First stop was Missoula, MT. Or "zootown" as the locals call it. It's a handsome college town along I-90, and it was a full day's drive from Seattle. I stayed overnight in Missoula at a motel, and really enjoyed strolling the streets of the town. Great BBQ was had at The Notorious P.I.G. BBQ in town. The next day, I set off towards Yellowstone. On my way there, I stopped for an excellent tour at the Lewis & Clark Caverns State Park. There were multiple caverns with intricate limestone designs carved by nature. I camped overnight at the state park. It was the most gorgeous campsite, and it was nearly empty. It was the night of my birthday, and I spent it all alone in the middle of Montana, bathed in solitude, serenity and the warmth of the campfire. There is something magical about camping. When you're out there in the wild, away from creature comforts, you learn to slow down and take great pleasure in the simple crackling sounds of the campfire, or the warm snuggle of a sleeping bag. It was an awesome start to an awesome trip. We got a day off from work on Friday, so a buddy and I drove down to explore Mount St. Helens. I've been to a couple of volcanoes before (1 in Indonesia, 1 in Nicaragua) and Mount St. Helens is pretty different in terms of its vegetation, terrain and soil. I remember the smell of sulphur at those other volcanoes and black soil. In contrast, Mount St. Helens feels more like a regular mountain, even though it erupted pretty recently. Or perhaps it's because we didn't go close enough to the mountain? At Johnston Ridge Observatory, we listened to a guide talk about the eruptions in 1980 and 2004, and watched a short film at the visitor's center before rambling for half a mile or so on a short hike. It was an uncharacteristically hot September day, and because of the recent eruption, the surrounding areas were not covered with tall trees. We rambled on the Boundary Trail for about a half-mile before turning back and heading for the cool, air-conditioned comfort of our car. I'd definitely recommend visiting Mount St. Helens on a cooler, cloudier day. I like visiting the Pacific Coast on the Olympic Peninsula, because it has some truly wild and amazing beaches. This is not another Caribbean destination with hordes of sun-seeking masses. It's always fun to try to spot beach creatures & wildlife around rocks and tidal pools. Alas, I didn't see a starfish. I took a short half-day trip to Mt Rainier to see some wildflowers. But alas, this year's summer was warmer than usual and the wildflowers were already gone. Two years ago at around the same time, the Sunrise area of Mt Rainier were literally carpeted with alpine wildflowers, but now, they were nowhere to be found. I did a short hike from Sunrise to Frozen Lake, and then to the First Burroughs Mountain and back to Sunrise again. I'd say the total distance was probably about 5 miles. There was hardly any elevation gain and it was an easy walk. Despite the lack of wildflowers, the scenery was still spectacular. This is Mount Rainier National Park after all. That shelf of ice covered half the lake when I was there two years ago at around the same time. Now, it hangs on tenaciously and will soon be gone. I took a couple days off for an extended 4th of July long weekend, and headed down to Portland with two friends on our bikes. It was my first long-distance bike ride, and in fact the story of how I got to know these two friends was pretty fortuitous. I met them at a dinner another friend hosted to welcome a Brown classmate to Seattle, and we got talking. These two girls, Kelly and Sharon, were about to embark on a month-long bike tour down the coast to California, where they both lived. They extended an invitation for me to join them on a training session around Seattle the next day, and for the Portland leg of their trip a few days later. I picked Kelly and Sharon up at Sammamish and we managed to load three bikes onto my sedan (two on a rack, one in the trunk) and headed to Redmond City Hall. We started off at a pretty leisurely pace along the Sammamish River Trail, finding time for a short break at the lavender farm. The lavender was in full bloom and it was very relaxing looking at the flowers and sharing a pint of lavender vanilla ice cream. We continued onto the Burke-Gilman trail from the Sammamish River Trail, and caught glimpses of Mt Rainier and Lake Washington along the­ way. It was a great, cloudy day for cycling and we didn’t even have to use sunblock. We stopped at the University of Washington and I showed the girls the classic view of Mt Rainier with the fountain in the foreground. We even saw line of little ducklings following their mama! After checking out the university, we left the Burke-Gilman trail and headed south to Capitol Hill, where we stopped and had a very late lunch of sandwiches. Then, it was more biking south till the I-90 trail and back across the lake. We rode through downtown Bellevue and onto the 520 bike trail, going past Microsoft (I excitedly pointed out that we were pretty much doing my bike commute), and back to where we started, Redmond City Hall. The total distance was about 42 miles, and it was the longest I’ve biked till that point, but somehow it didn’t feel tiring enough. I wanted to experience more of the exhilaration and challenge of a longer bike ride, and decided to join them on the Portland leg of their Seattle-SF bike trip a few days later. The day of the bike trip, I woke up extremely early, and set off in the wee hours of the morning to meet the girls in Belltown. It was about 5:30am when we set off from Belltown, cutting across downtown Seattle along 5th Ave and across the International District onto Lake Washington Boulevard. The cool morning air and sweet views of the lake and Mt. Rainier made this initial part of the trip very pleasant. We traversed the western shore of Lake Washington down to Renton, where we picked up the Interurban Trail and rode it southwards towards Auburn. This was my first time on the southern Interurban Trail (there’s another trail of the same name that runs north of Seattle; they don’t join up with one another) and it was a complete delight to bike on. We sailed past industrial parks framed with wild flowers and Mt. Rainier views, and made it to the southern end of the trail in no time at all. Lunch was a leisurely meal at a small Asian restaurant in Puyallup called My Lil’ Cube. The proprietress was friendly and I had a great time relaxing in the A/C and eating a cheap but generously-sized and utterly delicious beef bowl. It was over ninety degrees when we had to set off again, but thankfully, we had already covered over forty miles up to that point. It was to be a recurring theme of this trip – we’d wake up early, set off and take maximum advantage of the morning cool to cover distance, preferring to pace ourselves slower in the hot afternoons. The weather during the trip was uncharacteristically hot for the Pacific Northwest – it got up to 96 degrees at one point. When we arrived in Spanaway, the girls were exhausted, so we lounged under the cool shade of trees at the corner of a golf course for a bit, and decided to find a place to camp for the night. It wasn’t easy doing so – the parks in the area are said to attract unsavory characters at night, and the only campsite in the area was off-limits unless you were affiliated with the military. One of the girls ended up asking a family if we could camp out in their yard, and that was where we spent the night. We’d been going at a pretty leisurely pace on the trip so far, and the terrain was mostly flat, so I hadn’t found it challenging until the very last day. We started off early in the morning and I got a flat just as we were pulling out of our campsite. We fixed the flat, but it made me paranoid whenever my bike started making weird noises afterwards. Lunch was at a cheap teriyaki place just before we crossed the Washington-Oregon border. After a heaping plate of sweet and sour chicken and chicken teriyaki over rice, I snoozed off in my seat for a little bit. We must’ve relaxed in the patio outside the small restaurant for at least two hours before we finally managed to set off again. My bike is the one in orange. We crossed a very tall bridge across the Columbia River, a pretty harrowing experience because of the narrow shoulder and debris at the side of the road. Not too far from the bridge, we saw a sign for a beach park and decided to head there. It was a pretty good beach along the Columbia River, and since the day’s temperature was in the 90s, the water was warm enough to swim in. I enjoyed a good swim, while everyone else lounged around and just relaxed by the beach. We had already biked 50+ miles that day, and there were just 40 miles to go before we arrived in Portland. Feeling recharged and gung-ho after the break, we decided to continue onto Portland. By then, it was already 5pm so it was a pretty long ride into Portland. But we decided to do that anyway. In retrospect, maybe it wasn’t such a great idea. My bike continued to give off strange noises and I was truly afraid that we’d be stranded at the side of the road, especially since we had no air pump at that point. We made it to Kelly’s friend’s place just before midnight. The most awesome thing was that her friend, Avi, lived on a sailboat in a marina. We officially had the coolest digs in the whole of Portland for the next couple of nights. We woke up the next day and made a breakfast of bacon and eggs. I usually eschew bacon, but giving in to crispy strips of fried fat never felt so good – especially after biking 200 miles. It was the Fourth of July and the day couldn’t be better. We went to the beach that afternoon and later hung out with Avi’s friends in a park in downtown Portland, before ending the evening with beers and a spectacular viewing of fireworks from the deck of the boat, set to electronic music and a refreshing river breeze. The next day, it was time for me to head home. I biked to Union Station (and realized that Portland was super bike-friendly!) and took Amtrak back to Seattle. I was very impressed by the Amtrak Cascades line on the west coast. It was uncrowded and clean. Most importantly, it was super convenient to just hand my bike over at the baggage car and retrieve it at the end of the journey for just $5. I'm definitely looking forward to more train-and-bike journeys in the future. Meydenbauer Beach Park is only a half-mile from my apartment in Bellevue, but I only discovered it this summer. Swimming in the lake is so much more refreshing than swimming in an actual pool. Was craving some hiking on a weekday and decided to head to Mount Si in North Bend. It's a very short hike, at eight miles round trip, and I got up there with not very much difficulty at all. There weren't a lot of people since it was a weekday evening, but judging from the size of the parking lot, I could tell that this place gets really crowded on a weekend. Montana is one of my favorite places on Earth. It's just gorgeous with its sense of space and varied terrain. Flathead Lake is the largest freshwater lake west of the Mississippi, and I spent a beautiful May afternoon kayaking on the east side of the lake near the town of Bigfork. It was so amazing that I vowed to return to Montana. Somehow I also ended up buying a Montana State Parks Pass, so that's an added incentive for me to come back! So I went to REI, and came back with a $59 personal titanium pot. Yes, I admit I can go crazy at REI sometimes. It's amazingly light, but I haven't had the chance to bring it on a backpacking trip yet, so it's greatest selling point hasn't been proven just yet. Anyway, I've been having a ton of fun cooking with this pot. Last weekend I was out camping at the Beckler River Campground, and I made myself a hearty breakfast of steel cut oats cooked with almonds, cashews and chocolate. Sounds fancy, but it was literally just a pot of boiling water, large spoonfuls of raw oats, and a packet of Trek Mix from Trader Joe's tossed into the pot for good measure. Another fabulous Spring weekend in Seattle. I drove a few hours west in search of nature, and arrived in Olympic National Park. Distances are vast in the Olympic peninsula, so the night before, I camped at Sequim State Park. On Saturday morning, I woke up to the sound of birds chirping and drove another two hours to the western edge of the peninsula. My destination was the Ozette Triangle trail -- a roughly 9-mile loop trail that involves a jaunt through thick forest onto the beach, a hike along a wild, rock and log-strewn beach, and then another trek through forest via a different route on the way back. I was one of the first to arrive at the trailhead, and got a great start. By the time I hit the beach after the 3-mile hike through the forest, it was right about low tide. The receding tide exposed stretches of algae and seaweed-covered rocks and tide pools. This was no easy walk on the sand. It's as wild as a beach can get, with huge logs thrown upon the shore from previous storms, and washed up remnants of wildlife, rotting seaweed, and lots of boulders. It was, however, staggeringly beautiful, and though my boots were wet from trekking in ankle-deep tide pools and squishy beach terrain, there was no place I'd rather be on this wonderful Saturday afternoon. The start of the trail. You can head to Sand Point or Cape Alava and then traverse along the beach to the other end of the other trail, before making your way back. I headed to Cape Alava first. Skunk cabbage lines the forest trail. As you can also see, the forest portion of the trail was extremely well-maintained. Seattle residents will tell you that it isn't truly summer before the 4th of July, but it's only May and it feels positively like summer already. And of course, I'm taking full advantage of the beautiful sunny weather to go on hikes around the region. Last weekend, I took a short jaunt out of the Seattle metro area along I-90. I-90 is also known as the Mountains to Sound Greenway. It stretches from Seattle to its Eastern suburbs around the foothills of the Cascade mountain range, and winds up across Snoqualmie Pass all the way to the dry desert of Central Washington and beyond. Having lived in the East Coast where my notion of interstate was the busy, jam-packed I-95, I have to say that travelling along the I-90 is a real delight. This time around, I didn't drive too far - in fact, my destination, the Annette Lake trailhead, was only about 45 minutes east of downtown Bellevue, where I live. 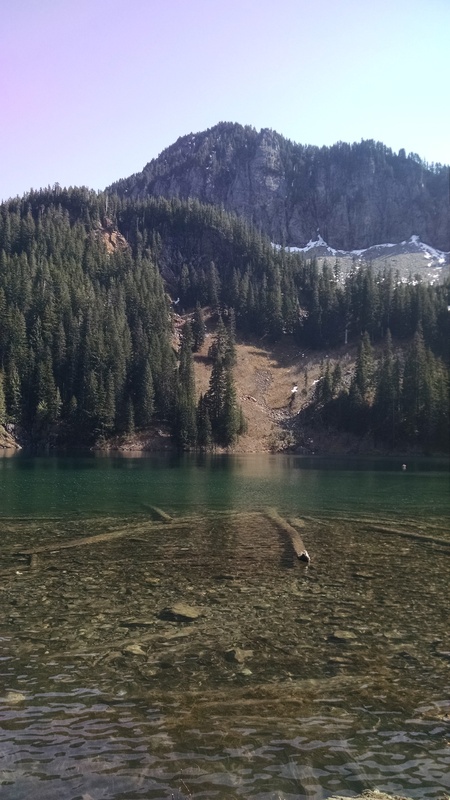 Annette Lake is about an 8-mile roundtrip hike. Just a short walk in from the trailhead, there's a small but gorgeous waterfall. It's loud enough to drown out the sound of cars (the trailhead is very close to the I-90 exit) and a great touch-point to reconnect to nature. The first couple of miles it's largely elevation gain through forest and a short stretch of exposed hillside under power lines (you can actually hear a faint buzzing sound from the power lines at that stretch). It's a very well-maintained trail and although it can get busy (I encountered a group of people every 5-10 minutes on the trail, and the parking lot was overflowing at the trail-head), it's still a great hike out in the woods. You can see how well maintained this trail is by this large log that is used as a footbridge. Steps have been carved in for greater support and balance. 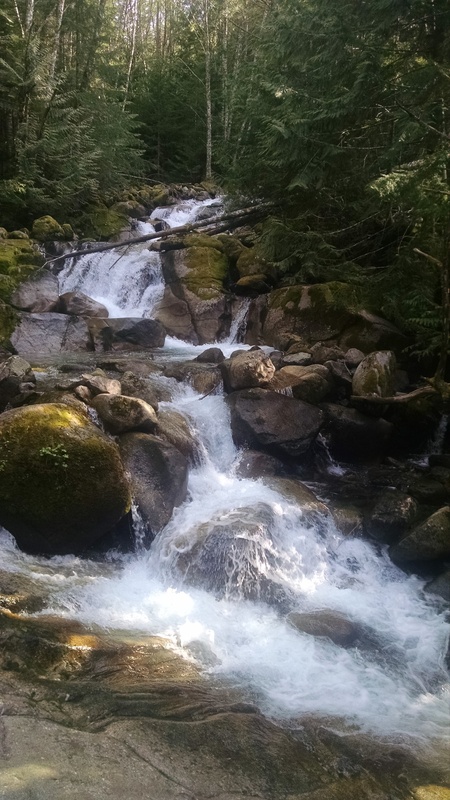 I hiked across cascading streams and stepped past mossy rocks. Past the halfway mark, the trail becomes more gentle and occasionally skirts exposed mountainside, offering glimpses of tall trees and other peaks. Occasional wildflowers along the trail add a splash of color. I hiked pretty quickly and only after about an hour and fifteen minutes in, I reached the lake. It's a nice lake, but as far as lakes go, this isn't the prettiest (check out Colchuck Lake) and there wasn't a large clearing to rest by the shore, so I took in the view and rested for several minutes before resuming my hike back to the trail-head. When I hike, the destination doesn't matter as much as the journey. And so I came away feeling like it was a very enjoyable and quick jaunt away from the city on a sunny Sunday afternoon. On a long summer's day, you might even be able to hike this trail after work if you're a fast enough hiker! 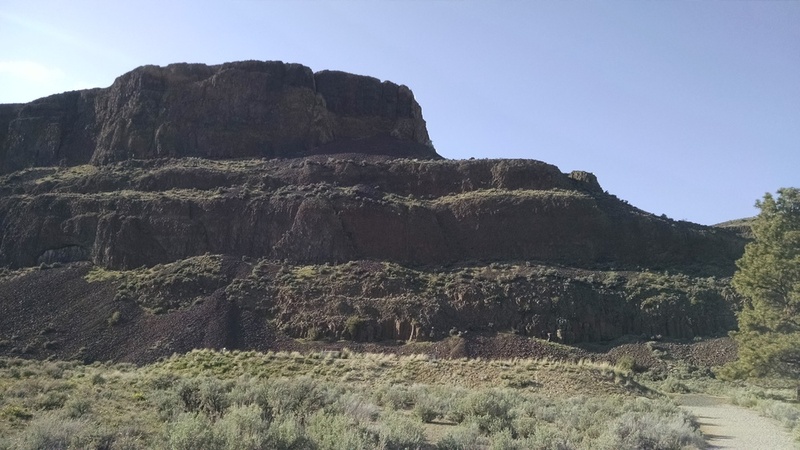 There's a place in the Central Washington Desert called Steamboat Rock -- what a lovely name! It's a massive rock peninsula jutting out into a lake just south of the Grand Coulee, and I hiked up to the top of it one evening last weekend. Yes, it looks massive, but it really isn't that hard to get up to the top. There's a trail that while admittedly steep at times, can probably get you up in around half an hour. Like most steep trails, coming down is the tough part because you'll worry about slipping and falling. Wildflowers were in full bloom. April and May are good times to visit the desert, when the flowers are out and it's not too hot. The top of the huge rock is a plateau that looks much smaller from the bottom. I spent more than an hour walking leisurely around its circumference, and taking in the gorgeous view of the little rocky islands dotting the lake and the desert canyon landscape. This shot shows part of the plateau, but if you squint really hard, you'll also see a herd of deer. My phone camera doesn't have a great zoom, but I counted 25 or so deer when I was there. I've never seen a herd of deer out in the wild before, so it was a real treat to just observe them. This past weekend, I went hiking in Eastern and Central Washington. One of the short day hikes I did was the Umtanum Creek Canyon trail. Umtanum Creek is a little creek that branches off from the Yakima River, and the trail meanders roughly alongside the creek as it goes deeper into an increasingly narrower canyon. The start of the trailhead is this gorgeous mint-blue suspension bridge above the Yakima River. This is a pretty lush canyon considering that we're in the middle of the Washington desert. Trees, shrubs and grasses abound by the sides of the bubbling creek. Splashes of yellow and purple. Wildflowers dot the landscape during springtime in the desert. This is probably the best time to embark on a desert hike, before the weather gets too hot and the bugs come out.